How to transform a cold run-down aviation warehouse into a cosy, warm telemarketing office which makes people feel at home and enables them to be highly efficient? Perfect Pitch is a telemarketing agency based in Witley, Surrey ushering in a new era of telemarketing services. An old run-down aviation warehouse was to be transformed into an office for their operations. 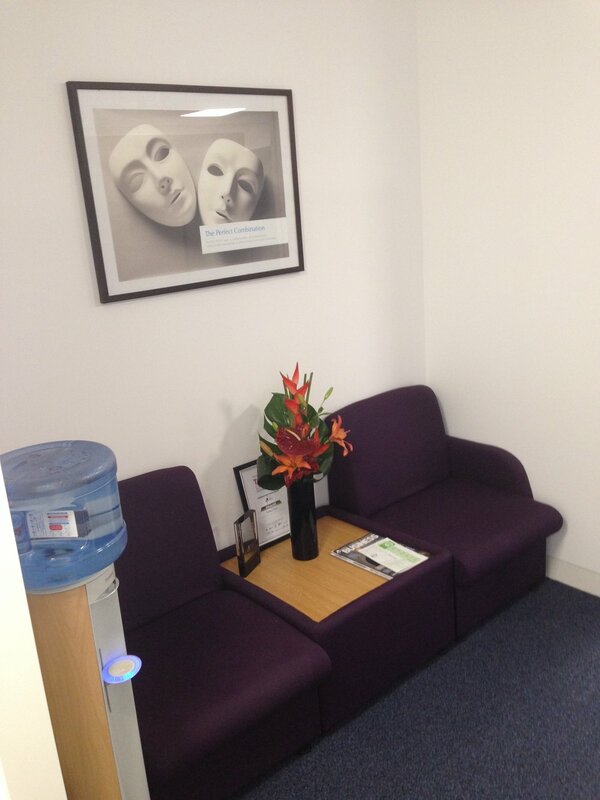 Our objective was to help design & build the new office for Perfect Pitch. It was to reflect the highly energised atmosphere of telemarketing. It should therefore be conducive to high performance and their staff were to feel at home in an open space area where they would be able to chase their targets with gusto and enthusiasm. Desks were areas for productivity. Basic amenities e.g. kitchen, toilets and a staff lunch room should beavailable and at no point should employees feel that they are part of an old decrepit building. Modernism was to be the keyword. The solution was to rethink the structuring of the whole area. 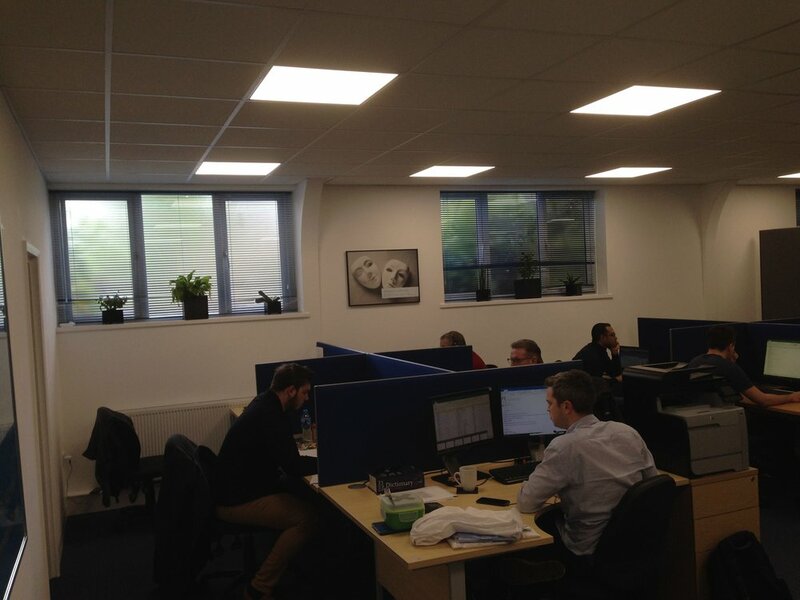 A large space was required to house all the staff, bringing a new unity and operational focus to the company. However as this was a run-down aviation warehouse a few essential steps had to be taken. Insulation was the first concept to be deployed. We started the project by surveying and producing building outlines on CAD, and then created an inner shell incorporating insulation into the metal stud, dry-lined walls, giving the building a thermal blanket for the winter. The provision for a new gas central heating system was also allowed for. We then started to remodel the interior space, drawing elevations and proposing a new suspended ceiling with new 600 sq LED lighting. We wanted to maximise all available space. The design incorporated the existing goods entrance shutter to be lifted and locked into position, covered up, creating extra pockets of space in the boardroom, which then allowed for double glazed windows to be placed. 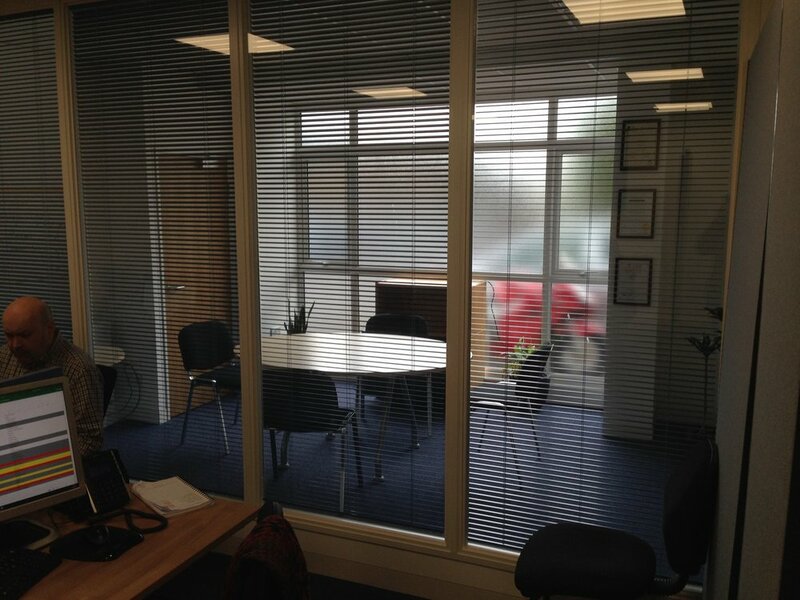 The boardroom was then designed using double glazed partition with internal louvre blinds allowing natural light into the adjacent workspace area. This would allow the telemarketing teams to enjoy natural light and get adose of vitamin D.
Next came the WCs. This was a real design challenge due to the small space. However we ended up providing the women with a disabled unisex WC, and the gents with a dedicated WC on the opposite side. The reception area and kitchen then followed by an upstairs staff lunch room, and storage area below which also doubled up as a server room. 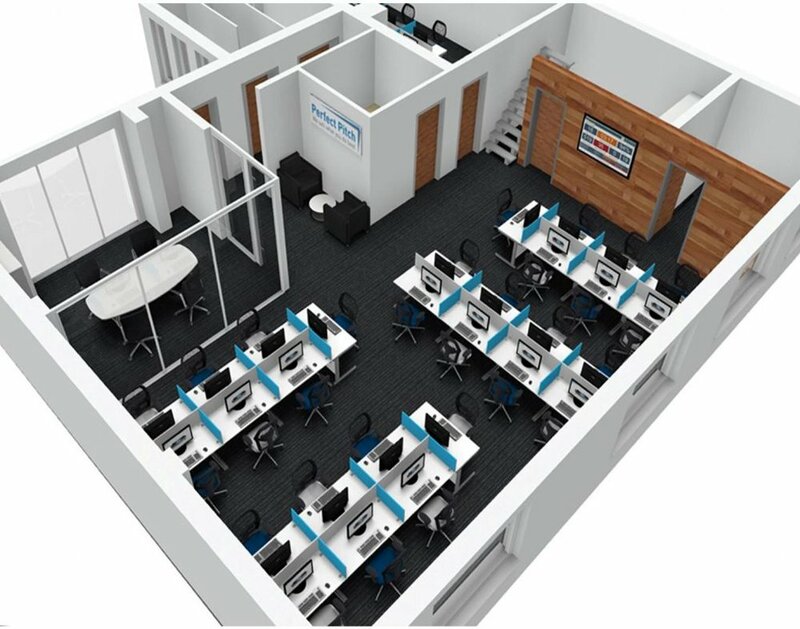 We needed to devise an area where the telemarketing staff would feel energised and connected to each other as well as have their own personal space to work efficiently. We opted for open space desking. 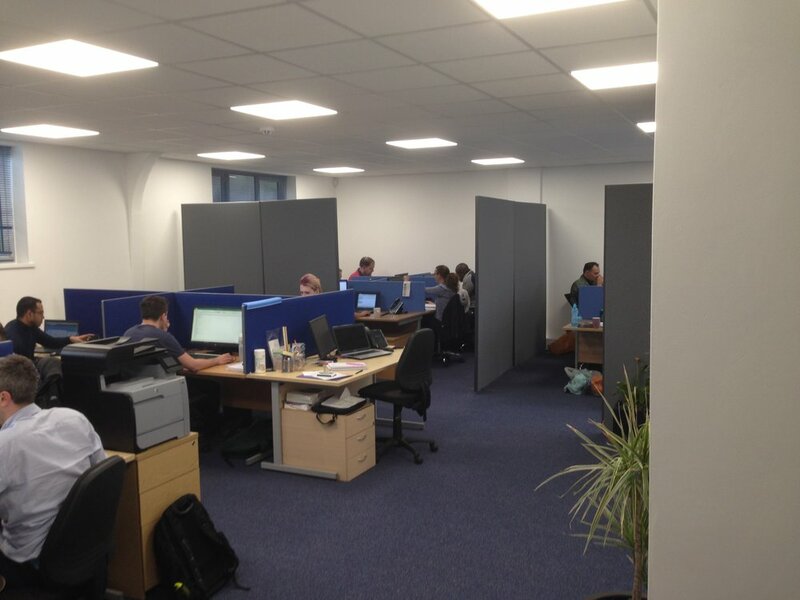 We chose a combination of existing and new desking. In order for an office design to run smoothly at the building stage it is essential that we liaise closely with the builders to maintain quality control, make on site decisions and amend drawing changes as required. For this project, to save on cost, we also converted the design drawings for the builders to build from. Perfect Pitch staff are all buzzing with positivity and enthusiasm and are happy in their new work environment. The end result and whole area transformation were, in the directors’ words, quite remarkable, meeting their expectations and more. This is a company on the go and ready to meet the challenges of the 2020’s.